One day left to go of the 30 days wild challenge, and our pollinator border project is complete! 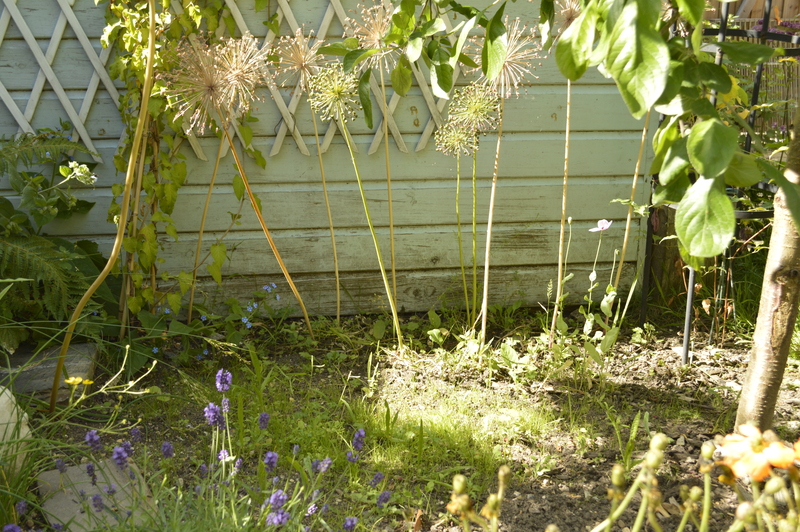 We’ve halved the size of the lawn in our garden, adding extra border along two sides of it, which we have filled with pollinator friendly plants. There are a variety of herbs, borage, evening primrose, geranium, papaver, lupins, cat mint, penstemon, snapdragons and more. The bees and hoverflies are loving it. Today we’ve also noticed butterflies in the garden, after only mentioning this morning that we hadn’t seen many in there this year. 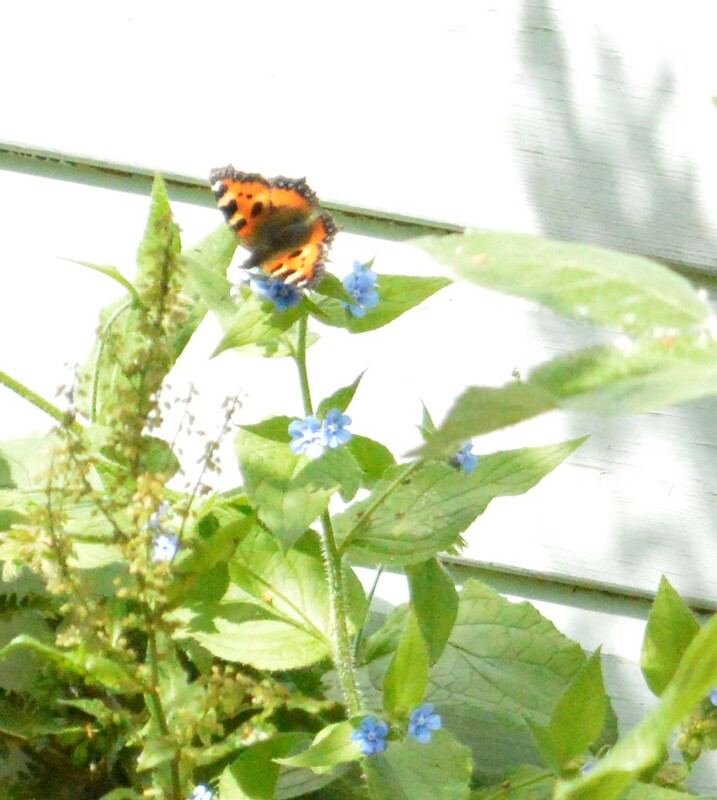 A beautiful small tortoiseshell flew in this morning, enjoying the lavender and the self seeded blue alkanet, before landing in our sunny patch of nettles. We hope she might have laid eggs, which is what we keep the nettle patch for. Phil even confided today that he occasionally waters to keep them in good condition for the butterflies. I’ve added some butterfly feeders to the garden, in the form of two litre plastic bottles, the bottom cut off and into a flower shape, coloured with sharpies, and attached to sticks with a wine cork and glue. 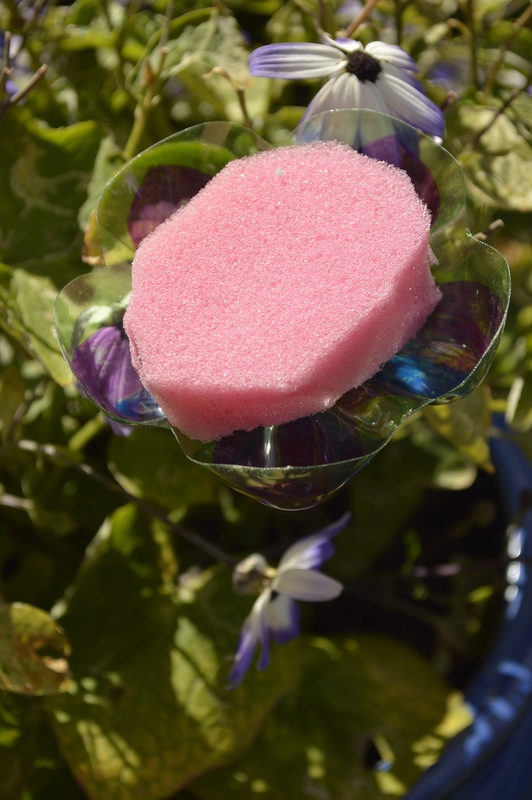 Inside I’ve placed a sponge, soaked in sugar syrup made by boiling up sugar and water and then cooling. Sadly, this morning we found one of our lovely guinea pigs, Peanut, had passed away. He’s buried in the new border, with a grey pot (to match his fur), marking his resting place, containing a nicotiana plant, with stark white flowers, another pollinator friendly plant. Underneath the plum tree I had started to create a wildflower meadow, scattering seeds at the end of May, just before 30dayswild began. I also planted wildflower seeds in two pots, and they are all doing well. 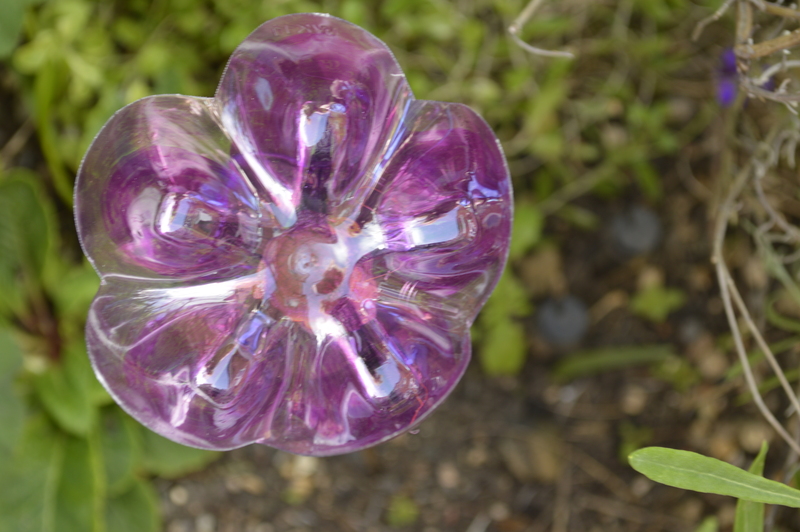 The first of the wildflowers flowered today- a beautiful purple poppy. I’m looking forward to seeing what else comes up. I’ve extended this at the back of the border, with some of the free seeds we received from the Bumblebee Conservation Trust as part of our membership. Today we also added more plants to the fence- one of the suggested random acts of wildness from the Wildlife Trusts was to “Green Your Walls”. We already have ivy growing up the front of the house, and one of our back fences, as well as honeysuckle and a pyracantha. The wall at the back of the house gets no sun at all, and has no soil in front of it to plant anything in, so the other fence was my next target. I have hanging baskets full of sweet Williams along the fence and one containing a campanula and some lilies. 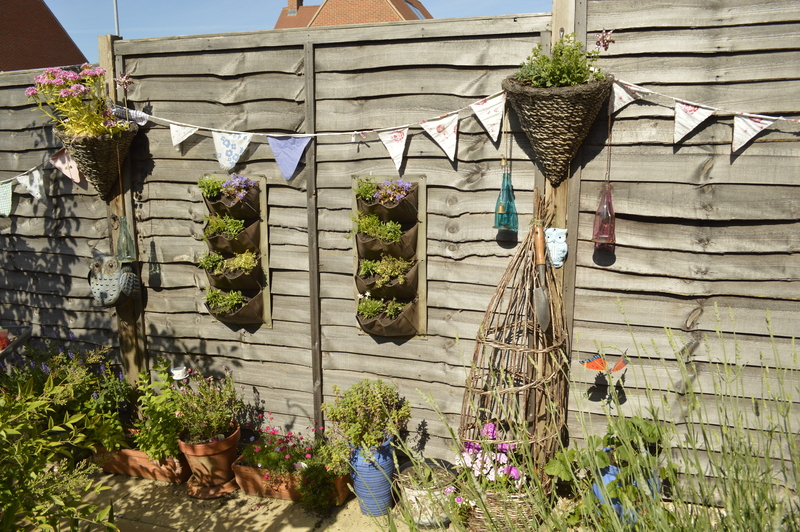 The fourth basket was not doing well, and neither was another that I have elsewhere so these were repotted with campanula and I added some pouch planters to the wall, planted with campanula and other alpines bearing the bee symbol to indicate that they are pollinator friendly. 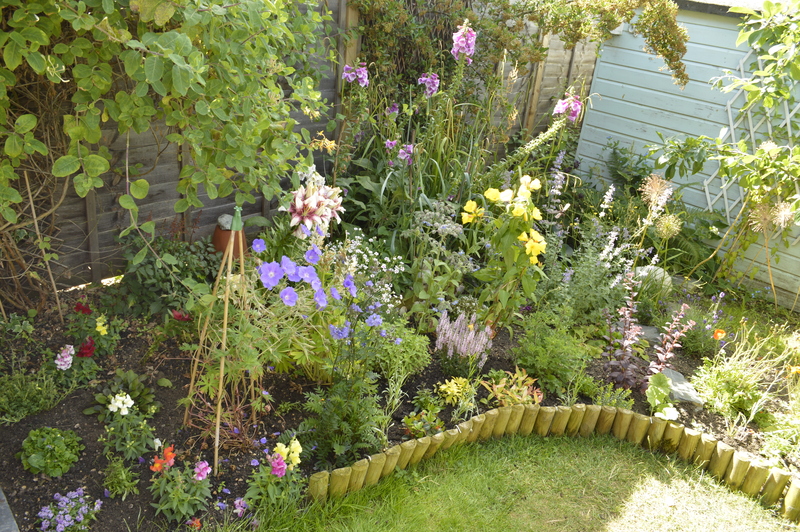 I’ve added some lobelia as well, which aren’t good for pollinators but will fill some of the gaps and add colour. 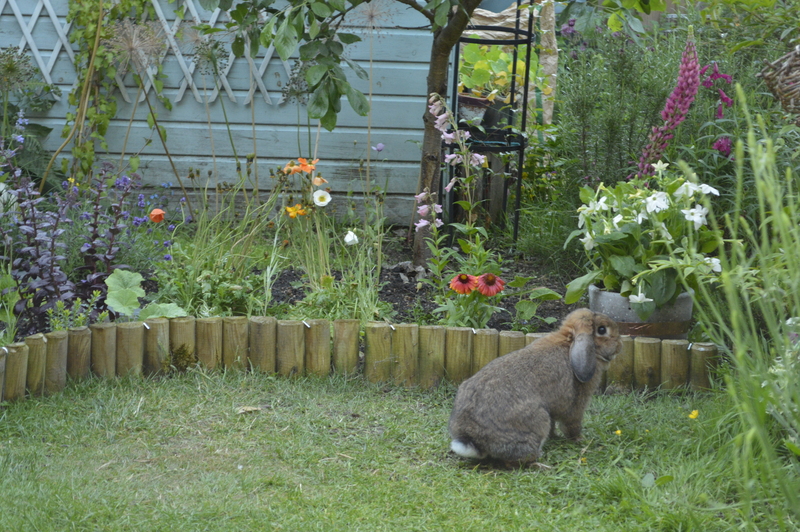 This evening our rabbit, Buttercup, decided to join in the 30dayswild action. She is a house rabbit, or has been up until now. Buttercup used to live in a flat in Liverpool, with my sister and then her flatmates. 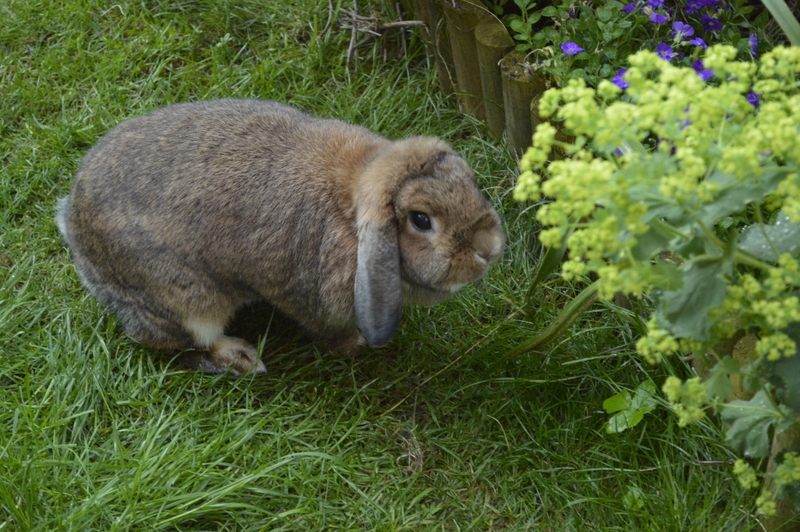 In August last year she came to live with us and has shown no interest whatsoever in coming outside. We leave the back door open often, and she pokes her head out and then turns round and heads back inside. Tonight, she decided to come and see what we’ve been up to in the garden. She spent a long time scent marking plants, hiding under the hydrangeas and sniffing everything in sight. She seemed to enjoy being a “wild” rabbit for the evening. 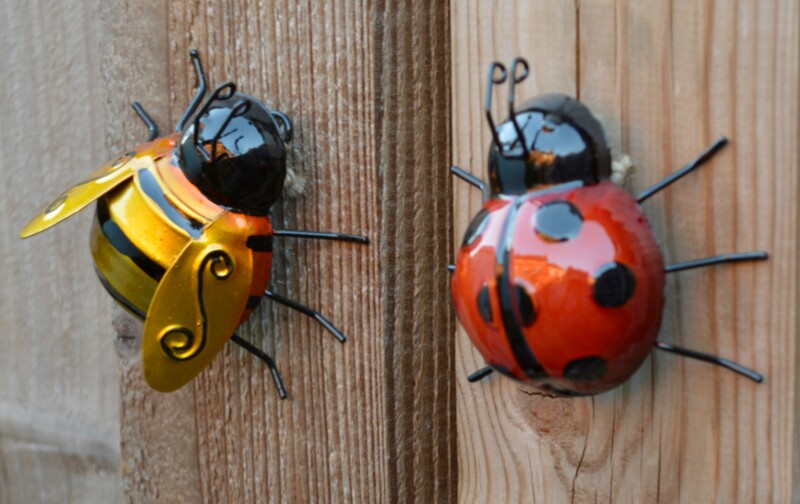 We’ve added a couple of “wild” ornaments to the garden as a reminder to stay wild! We’re really glad to have improved the wildlife value of our little patch, the next job is to add a little more into our front garden. In the Autumn we’re planning to add a rowan tree for the birds, and I want to plant hebes, dwarf lavender and snapdragons as well as some early flowering plants for the bees. 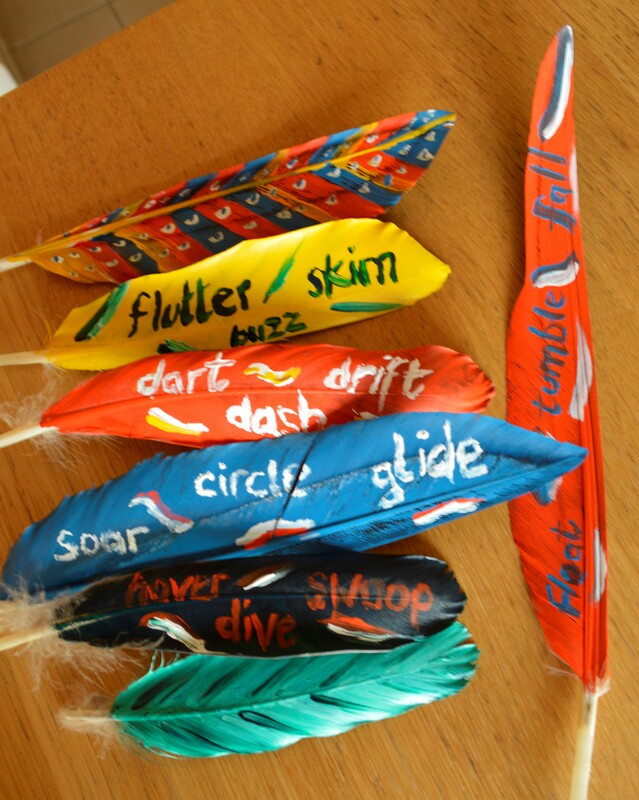 Tonight I did some wild art, painting feathers, decorating them with words related to flight, from my observations of birds, bees and butterflies during this challenge. I quite like them, but Phil says he prefers the feathers as they were! We do have a lot of beautiful feathers, gathered when we have been out and about walking and exploring over the last few years, on our nature table, so I do appreciate how lovely they are anyway, I just fancied trying something different with them. 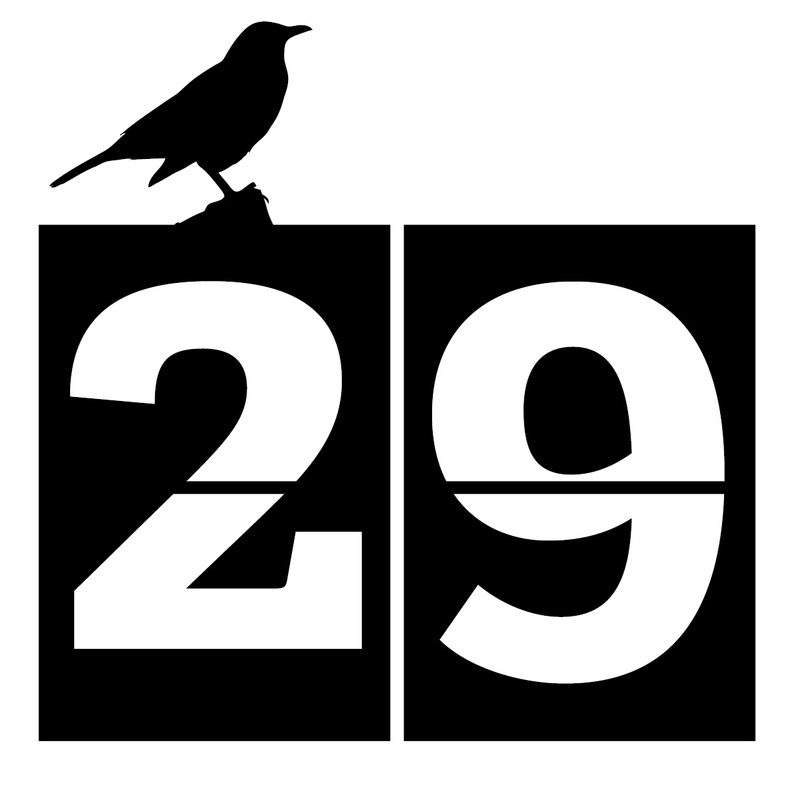 I can’t believe it is the last day of 30 days wild tomorrow, the month has gone very quickly. We have an evening celebration planned to mark the end of the challenge.